It’s summer time and our local Farmers’ Market has strawberries on sale for only 99 cents! Yep, time to look for some new Delicious Desserts Using Strawberries! Fresh strawberries taste absolutely wonderful in desserts, especially if you use them right away! And if you can get the kids out for strawberry picking, they’ll love using the strawberries they personally picked in recipes! Get ideas for how to use your fresh strawberries in this list of strawberry desserts! 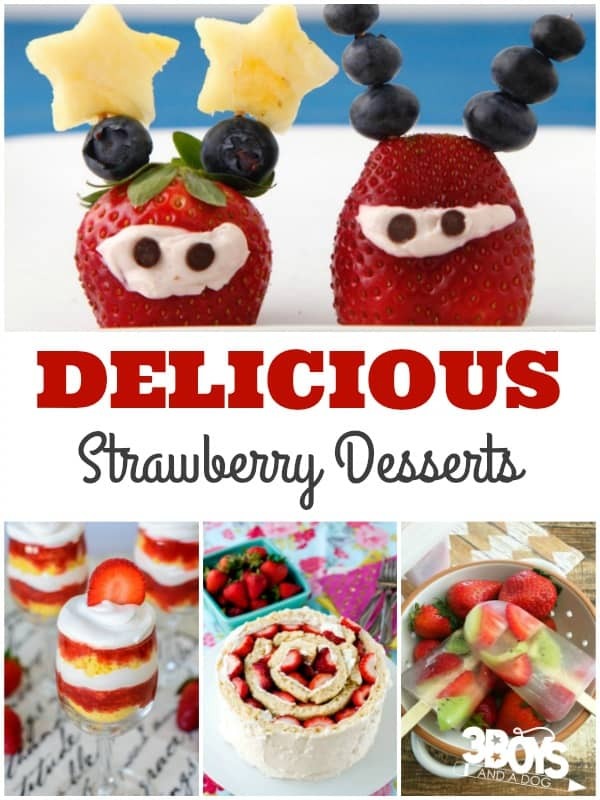 And if you want more ideas, don’t miss Over 10 Fresh Strawberry Dessert Recipes! Use this recipe for Chocolate Strawberry Hot Milk Cake to make fluffy cupcakes! If you’ve been craving Orange Julius, you’ll love this Orange Julius Strawberry Banana Smoothie! This Strawberry Aliens Snack is such a fun way to serve healthy food to kids! These Healthy Strawberry Kiwi Ice Pops look so refreshing, especially on a summer afternoon! This Easy Strawberry Refrigerator Cake is so simple to make and serve! Don’t buy store-bought Fruit Roll-Ups. Make your own Homemade Strawberry Fruit Roll-Ups! Avoiding gluten? Try these Grain-Free Strawberry Shortcake Trifles! This Strawberry Coffee Cake would be perfect as a brunch treat or an after-school snack! If you make this gorgeous Strawberry Shortcake Roll-Up Cake, your dinner guests will go crazy for your presentation! These Strawberry Dumplings would be amazing served with ice cream! Use fresh strawberries to make these delicious Baked Strawberry Donuts! This Strawberry Pudding Pie uses Jell-O pudding and fresh berries to make a delightful treat! I’ve made homemade popsicles before, but I’m definitely going to try these Strawberry Lemonade Popsicles! This Strawberry Peach Galette is absolutely lovely and would be great topped with whipped cream! Make this light and airy Strawberry Mousse! Put together this Easy Strawberry Trifle Recipe for a simple, layered dessert! Ever thought about mixing chocolate with strawberry shortcake? This Brownie Strawberry Shortcake has both! This yummy Strawberry Cream Cake would be a decadent treat for after dinner! This Easy Strawberry Soup is served chilled for a great warm-weather snack! Kids will love eating these fun Chocolate Covered Strawberry Skewers! Make this Strawberry Rhubarb Crumble for a lazy morning family breakfast! Hand pies make great snacks! These No-Bake Strawberry Rhubarb Mini Pies would be a handy afternoon treat for children! Swap out traditional fruits like peaches and apples to try this Homemade Strawberry Cobbler! This Strawberry Crisp is so simple to put together. It’d be great on a fall morning! Looking for a quick, healthy breakfast? Try this Easy Strawberry Smoothie Recipe! Use these resources to make these delicious desserts yourself!